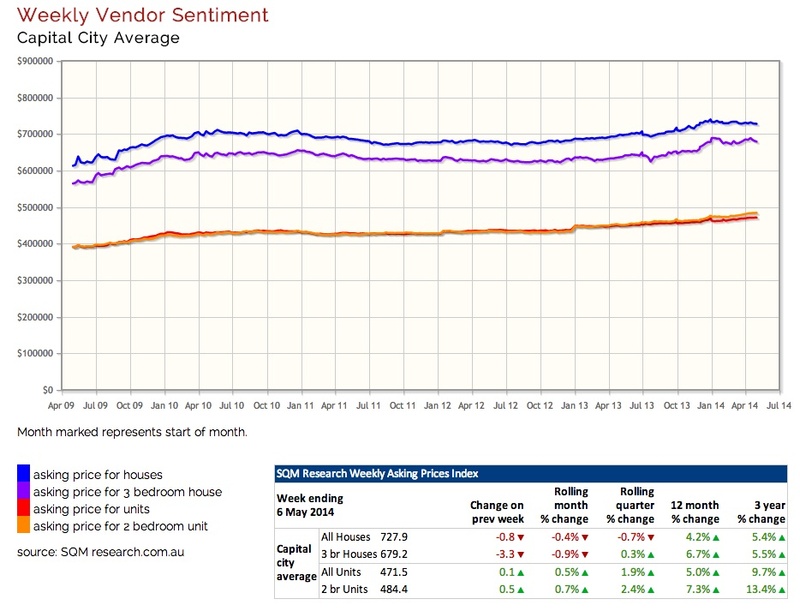 Every Tuesday at SQM we update our weekly asking prices/vendor sentiment index for the previous week. Last week, capital city asking prices for houses fell by $800 to $727,900 while for units there was a slight rise of $100 to $471,500. However as you can see from the chart, capital city asking prices have been flat since the start of the year for houses, while units have risen just over 2%. The key influences behind the recent movements in the capital city average results include falls in Melbourne, Canberra and Perth, with Sydney recording lower than expected rises. Lets quickly go through each of these cities. Melbourne has now been recording falls in asking prices since the start of the year. The falls have been modest to date, but falls they are. This is consistent with what has been lower auction clearance rates recorded for the start of the season. Real clearance rates in the late 60’s is soft for Melbourne and it is consistent with some ongoing high stock levels. For now we will stick with our +3 to +6% capital growth forecast for 2014 but I am thinking it will now be a figure closer to 3% rather than 6%. The drops in Canberra are looking very sizable now. Canberra asking prices on houses are off 13% for the last three years – that’s a full blown downturn. Back in September within our National Housing Boom and Bust report we forecast a -1 to -4% decline for the year and I would say that forecast will be correct or slightly understating the falls that are being recorded to date. 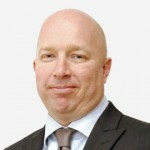 The Perth housing market is looking weaker. Last week we spoke about the rapid decline in rents and since then stock on market for Perth recorded an unseasonal (albeit slight) rise in listings during April to 20,507 residential properties. On top of this, asking prices fell by 1.3% for the last 90 days for houses. Units fell by 0.8%. Our forecast of a 4-8% increase in dwelling prices on Perth is looking a little shaky at this point in time. In the March quarter they were in the 80’s for what was a record opening to the year. Meanwhile asking prices for houses have paused since the highs of December. But in this instance I am cautious of the data, as we know there have been record levels of auction listings and a record low number of properties listed with asking prices. As mentioned above, stock levels are still at very low levels. So is the housing boom over in Sydney? Sure there is going to be periods where capital growth will oscillate in the overall recovery. It takes a powerhouse economy to have 6%+ growth rates every quarter and we don’t have that. But to suggest that the boom is over because growth rates are less than 6% in a quarter is laughable. So far, each and every source I have on the ground in Sydney is telling me demand is still running hard. So we are sticking with our 15-20% call on Sydney. Overall the market remains in recovery but it does not appear to be right now, a strong, surging recovery. I wonder if the somewhat benign conditions are related to what came out today on consumer confidence. For those who did not read the news, consumer confidence fell sharply over the past month. The confidence that was in the community immediately post the election has completely vanished. Indeed it is now lower than prior to the election. Surely now, the debt levy is on the scrap heap? I am a believer that it is important to get the budget back into the black over the medium term, and that takes some pain. But there are better ways of doing this than adding a new tax during a time when GDP growth and confidence are running below trend. But I suspect now the levy idea may well get scrapped. Negative gearing changes anyone? !